Nautical Drive is a steep ramp from West River Road to the existing marinas in Vermillion, Erie County, Ohio. A slope failure site was located on the northeast side of Nautical Drive immediately northwest of the intersection of Nautical Drive with West River Road. The height of the failed slope was visually estimated to be about 20 feet (at the northwest end) to about 35 feet (near the intersection). A drainage ditch with standing water was observed at the toe of the slope. The existing slope failure on the northeast side of Nautical Drive appeared to consist of severe slope sloughing, with an approximate length of 100 to 120 feet. The primary slope failure appears to have occurred near the top of the slope at Nautical Drive with an apparent main scarp located along the edge of concrete pavement. The main scarp was visually estimated to be about 3 to 4 feet deep. Normally, a slope stability analysis would include inclinometer data to help define the failure plane. However, based on the project schedule, inclinometer data was unavailable. Without slope inclinometer data, we relied on the existing slope failure conditions and our past experience with slope failures to perform soil parameter calibration. To establish the soil profile for stability analysis NTH performed test borings into bedrock to depths of 10 to 30 feet below existing grade. The slope stability analysis was used to evaluate the existing and proposed slope with repairs. The existing slope grade is currently 1 foot horizontal run for every 1 foot of vertical rise (1H:1V) for the top 6 feet of the slope and flattens to about 1.8H:1V on the lower portion of the slope. The total height of the analyzed section was approximately 31 feet. Due to the shallow bedrock at this slope, we analyzed the cross section for shallow failures within the overburden soil. The results indicated a marginal factor of safety occurred as a shallow failure in the long term, drained condition. Based on the existing site and soil conditions, NTH proposed three slope repair alternatives for selection. RSS or MSE retaining wall using geogrid. 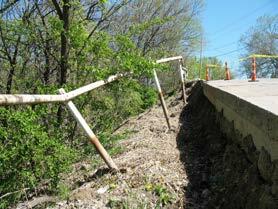 Special benched slope repair (in general accordance with ODOT GB2). Secant wall earth retention system using drilled shafts. bedrock, NTH compared the construction costs and recommended a MSE wall as the most cost-effective alternative for slope repair.